Sant'Ivo alla Sapienza was difficult issue for Borromini, conditioned by the pre-existence of the palace and the courtyard, made by Giacomo della Porta, who left a roughly rectangular space very limited to the church arise. Since these constraints he will derive an occasion of great freedom. Choose a triangular matrix that lets you create a body already oriented by lines constructed triangle; doubles the triangle to create a six-pointed star that it takes up the whole surface available, and to this form subtracts and adds circular spaces within a strict logic diagram. The need to make the most of a square-shaped lot, the interest in a wrap mixtilinear (which would allow him to continue the experience of San Carlino alle Quattro Fontane) and the idea to draw inspiration from symbolic forms (capable of tying the origin and scheme of the primary meanings) will be the inspiration for the project. The result is obtained with extreme purity and apparent simplicity: the centralized plant, mixed-line, drawing a sort of six-pointed star, and the walls they modeled the perimeter. The wall is divided by a series of fluted pilasters, the thin horizontal cornices, which underline the interior concave and convex corners of the church; above this range, there is a frame not excessively protruding, with entablature functions, where we find the reason for the slightly concave ceiling, already seen in San Carlino; Finally, the dome rests on the entablature with thin ribs that converge at the last ring of the lantern. The interior space is enclosed in a housing unit where there is a classic reference to the Pantheon, as evidenced by total visibility from every part of the whole structure. Moreover, the geometric origin, created by the contamination of hard shapes and concave forms, suggests a balance of centrifugal and centripetal movements, interwoven. The deepest conclusion is upwards, where decorations of stars, which shrink, and the image of the Holy Spirit on the lantern ceiling, suggesting enormous and untouchable heights. The effect of the light, which comes from the lantern is crossing both the windows, is extremely effective and, combined with the total whiteness of the walls, it seems to make the walls of the church as diaphanous and transparent. Inside there is the altarpiece with St. Yves saint of lawyers Pietro da Cortona, unfinished at the death of the master in the 1669 and completed by his students. 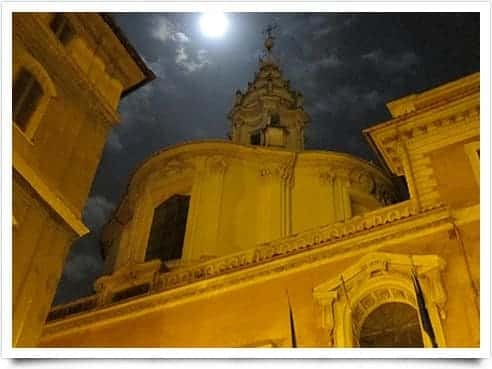 Been Sant'Ivo alla Sapienza or did you have the opportunity to visit the place as a tourist?